If what you are seeking is redemption and an escape strategy from Amicus Plaga (Friend of the zone?) , there is a dedicated Wikihow DIY page for that. Before I open this discourse, I will give anyone reading this fair warning that emotions and blatant myopia should be left at the door if they cannot be permanently discarded in any exploration about spiritual matters. Small, innocent, dirty, naked boys, oblivious of civilization, with little care in the world except to live to see tomorrow. Where does one go when there is nowhere to run, when there is no one to run to anymore? ...and when that day shall come. Their innocent faces, made in His image still, small innocent faces who know little of what it means to live. Downtrodden, thin, miserable, hungry, emaciated, weak, sickly, the life drains from their bodies as their stomachs grow bigger. 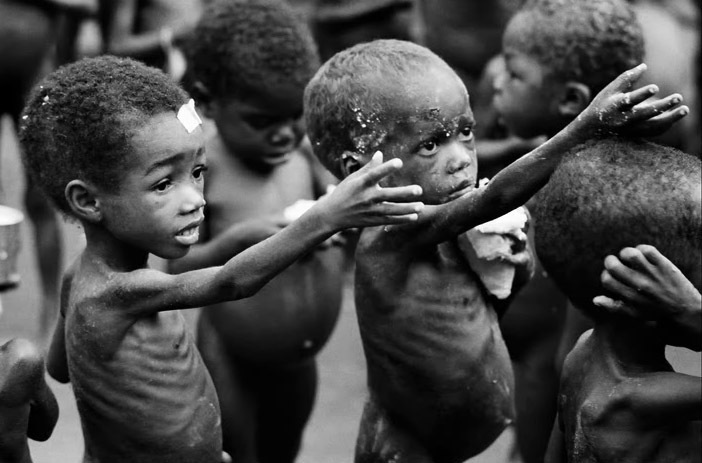 Two little boys, hand outstretched, reaching out to the only meal they have had in several days. Their faces are the tales of young lives with so little, and yet, so much, dreams of food, anything, now that all their fathers’ cows are dead and eaten. Their mother is suckling the ninth born, or is it the tenth, counting is a bit fuzzy in this times of life and death, hunger and satisfaction, love and war, tears and joy. There must be a bigger world out there; there must a world beyond the stars where not everything is so fuzzy. Where is God that he should let them die like this, we ask, and look upwards for an answer, as if we expect His voice to boom down to us of how we have killed who we are. We are rotten beyond measure, the maggots feed upon our conscience when this little faces are cast in the news, kill us in the comfort of our home as we go to bed. The idea that someone else does not have, has not had anything to eat, drives a knife through our hearts, so we wake up and pray to Him, to give them food and a long life, and we give alms, more so that we should live again, inside, than for them. Their little ribs stick out of their chests like the strings of a guitar, complete with a thin body to pluck, fingers, frets, strings…..and the thin neck that supports that seemingly enlarged head, behind those big eyes where a big smile exists, somewhere. From the look on their little faces, you can tell they have been in their idea of a food fight, like small kids for whom manna is brought by big trucks from the city, manna that they will eat even if it is rot, if only to kill that sensation they have had for the year. The third one clutches at his too, his other hand outstretched, he was fighting with his friend earlier, but there’s more, perhaps enough for everyone, he must get some to share with his small sister, too young to walk, too weak to learn how to…. The other stands, confused, the jigger on his foot, the itch on his ear, he is confused, is this really food? Is this a dream? What is happening, am I really here, now, eating? The last one has had his fill, he was the first one here, he jumped the line. He watched as his friends fought but he’d rushed home with his first share, to feed his wiry, old and feeble grandmother. She ate with her eyes open, and slept, or went to where those who sleep forever go, he ran back, this time for himself…. Five little faces, small booklets of tonnes of tales, where the sun touches their faces as they play, they pray to Him who might listen, that theirs is a penance they will to understand, but the quagmire is norm. They feed, but no one gives them water.